Beautiful things happen when people work together to deliver something meaningful and close to their hearth. When Silvia from salvialimone approached me at the end of the summer in 2018 and asked me if I would be interested in co-hosting a masterclass on visual branding and social media with her and Antonella from Pinterestclinic, I could not be more excited. The three of us realised quickly that we wanted to create a masterclass focusing on our students’s professional development and to offer a comprehensive class packed with practical learning opportunities according to their individual learning needs. Silvia and I co-facilitated group discussions alternated with 1:1 exercises. We helped our students to explore the core values of their creative business and how strategically bring to life their brand’s personality based on authentic values meaningful to them and their brand.Whilst working on these important aspects of branding, I kept reminding myself and our students to look into what really matters and to listen to their inner wise voice to guide them through their creative journey. We shared styling principles/ photography fundamentals with our students and techniques we rely on when creating a visual story. Students were given plenty of opportunities to style and create their visual story. The light on the day was just perfect. This is the final result of one of our student’s styling & photography. . Isn’t it beautiful? When we thought about the masterclass, Silvia and I wanted to explore each aspects of putting together a small gathering from sourcing tableware, ceramics, flowers, and bring to the table seasonal food cooked by us for our students . We cooked in the charming kitchen of Merci Marie and styled a convivial rustic table set with Ayse’s ceramics. Sitting together and sharing a meal gave us all an opportunity to deepen our conversation and get to know each other. The menu was a joy to put together as well as the table and the gift for our students sponsored by Belazu. The outstanding Mediterranean ingredients from Belazu opened our meal with Bruschetta with artichokes truffle pate’ and rose harissa followed by Violetto Artichokes on lettuce leaf with picked green strawberries. As main, we indulged over handmade spinach and ricotta ravioli with brown butter and balsamic pearls. I will write the recipe in the next post. We ended the meal with Silvia’s chestnut and coffee cake which was simply delicious and special. After lunch, we dived into the technical aspects of Lighroom to edit pictures our students took in the morning. Silvia shared her insightful expertise on how to create a consistent and visually appealing images based on our students brand values and in line with their colour palette and mood. Antonella shared her extensive experience as Pinterest Consultant and helped our students to understand how Pinterest could improve small business when used appropriately and strategically. From how, what, when to pin and must have boards according to each student’s profile, this was an eye opener session which wrapped up nicely all the work done throughout the day. We are planning to bring this masterclass in Italy! Stay tuned. I can’t wait to reveal more…..
2018 has been a very creative year for me, full of surprises, new friendships, creative collaborations and new discovered passions. The year in which I called myself stylist and used the powerful tool of photography to convey my passion for food, lifestyle and interiors. The year where I felt completely at ease with my multi-faceted personality. A full year of vitality despite encountering inevitable hiccups, at times upsetting, which are part of life. I have many things to be grateful for and many people to thank for trusting me, getting to know me, and their unconditional encouragement this year. Silvia , Antonella, Monika, Hanna, Jeremy, Valentina, the Table magazine team and foremost my eternal companion Niko always ready to inspire, share and support. 2019 will start with a creative masterclass on visual branding and social media strategies on January 27th in London. I am also working on a big project with food at its core and I can’t wait to tell you more about it! In the mean time, I hope you have enjoyed the holiday season with all its bustle, peace and lights and I wish you all a beautiful year ahead full of love, health and fun! Heat the almond milk for one minute in a small pan . Stir in the orange juice and orange zest. Combine with the flour mixture and stir until it forms a soft dough. On a lightly floured surface, knead the dough for 1/2 minutes. Place in a lightly greased bowl and let rest for about 10 minutes. Fill the rolls: roll the dough out in a 14x8 inch rectangle. Spread the softened butter on top. Mix together the cinnamon, sugar, and remaining orange zest. Sprinkle it all over the dough. Roll up the dough tightly. Cut into 10-12 even rolls and arrange in a lightly greased 9-inch round cake pan or pie dish. Loosely cover the rolls with aluminum foil and allow to rise in a warm, draft-free environment for 60-90 minutes. After the rolls have doubled in size, preheat the oven to 190°C. Bake for 25-30 minutes until lightly browned. Cover the rolls with aluminum foil after 15 minutes to avoid over-browning on top. Make the glaze: Whisk the confectioners' sugar and orange juice together until smooth. Drizzle or spread over warm rolls. Food always tastes better when it’s shared and Christmas food is not certainly an exception! I thought to share one of my favourite recipe for Christmas, which will bring out the intense flavour and texture of mushrooms on your table. For this recipe, I used dried porcini mushrooms picked by my parents in Tuscany and black squid ink tagliatelle to elevate the experience of this dish. If you would like to end your Christmas meal with brown tones and distinct flavours, I would suggest the delicious vegan caramelised walnuts and chestnut cake with coffee liqueur made by my dear friend Silvia from Salvialimone. We tested both recipes together with the hope of bringing something special on your Christmas table. I wish you the very best for a calm, happy gathering with your nearest and dearest! Place the dried porcini in a bowl, cover it with hot water, and allow them to soften for about twenty minutes. Then drain, reserving the liquid. In a large frying pan, heat the oil. Add the onion and garlic and fry for a few minutes. Add the porcini and cook for another minute to combine the flavours. Sprinkle with salt and pepper and cook, stirring occasionally, for 2-3 minutes, or until the mushrooms have released their water and are tender. Add a little of the porcini liquid and let it all bubble for 3-4 minute to reduce. Add the red wine and let it bubble for another 3 minutes. Meanwhile, put a large pan of well-salted water on to boil in preparation for cooking the pasta until al dente. Drain and toss with the mushrooms sauce. Divide between bowls and serve, passing around grated parmesan cheese and add a sprinkle of black pepper for those who want it. Last week, my friend Silvia from SalviaLimone and I shoot all day at my place. One of the shooting was coffee and cake and involved setting up a table sharing Silvia’s vegan walnut and chestnut cake. This is the best winter cake I have ever tasted in my life. Silvia’s cake not only looks gorgeous but also tastes insanely good!The combination of tree dark brown ingredients as chestnut, walnuts and coffee liquor make this cake standing out of the winter cake crowd!I am sure you will love it too! Turn the oven at 180Â°C. Grease 3 tins of 10 cm with olive oil. - Mix the 2 Tbsp flax meal + 6 Tbsp water in a small glass. Set aside for 5 minutes. Melt the cocoa butter in a bain-marie. Meanwhile, wash and peel the potatoes and cut into chunks.Steam the potatoes for 15-20 minutes in a steamer (or roast whole potatoes 30-40 min). Assemble the cake when the cake has cooled down and the frosting is solid enough to be spread. If the cakes are ronded cut the round top with a very sharp knife. If the cake is fragile start with a thin layer that will hold the crunbles. Then place the layered cake into the fridge for 20 minutes. When the cake is cool, you can finish to frost it. For the full description of this procedure please visit :how to cover a layered cake with vegan frosting. This is a unique learning experience designed to bring your creative business to the next level due to the comprehensive and relevant topic covered: Styling & Photography, Visual Branding, Pinterest and Social Media. This masterclass is open to individuals with a range of backgrounds and creative business although we believe that small brands, entrepreneurs and people who work in the food industry as food bloggers will find this class extremely beneficial. Seat are limited to 4 as every person will work on stretching individual learning needs and will be given plenty of support and constructive feedbacks throughout the day. The day will start at 9am and end at 5pm. Under the guidance of Silvia and Catia, you will explore food photography, styling and branding. Silvia will also focus on how to approach and grow your Instagram. With the extensive guidance of Antonella you will explore everything about Pinterest, including SEO and how to grow your audience on your blog. There will be plenty of hands-on time to master and implement relevant adjustments to your Pinterest profile. Prior to the masterclass, we will review your portfolio and social media accounts ( Instagram & Pinterest) in order to understand your visual brand and understand your current work. This will also help us to identify improvements strategies according to your unique needs and come up with suggestions for the next step in bettering your brand. On the day of masterclass, you will master and implement improvements strategies and leave empowered and confident to make further adjustments. You will also be offered two follow up of 30 minutes via Skype with Silvia and Antonella within 8 weeks of the masterclass to evaluate your progress based on your personal objectives discussed during the masterclass. Finally, you will receive a unique tailored Lightroom preset which reflects your brand identity. This will help you to start your new photography journey with more confidence. • what is storytelling and how to choose a relevant story which reflects your unique brand. • Instagram tips and strategies. Antonella is a Pinterest Coach, mentor and creator of Pinterest Clinic. Antonella has worked for agencies such as Hello Society and New York Times Company. Silvia is the creator behind SalviaLimone. She is a well establishes photographer and former fashion designer. Her career as photographer started many years ago In Italy as assistant photographer for Marieclaire Maison Italia and other interior magazines. Catia, creator of Pastalab Tuscany, is a food + interior stylist based in London. She also works successfully as Clinical Psychologist. Catia and Silvia often team together to work for magazines and photography projects. One of their latest project, has been featured on Table Magazine. Getting closer to December, not only means entering the coldest months of the year but also reflecting on the year 2018. The process of reflecting is vital to take the the first steps in creating an amazing year ahead before anything else. I believe that a simple reflection can help us to gain insight, learn about our experiences and see how to move forward. I will be using this space today to reflect on the meaning of collaboration as this has been a year of new professional connections and rich creative collaborations. So what makes collaboration work? Based on my experience, good collaboration is based on trust and the inner freedom that arise when you come together. Good collaborators are deeply attuned to one another. At some point, I felt as I could understand and anticipate my partners state of mind without direct discussion. There is something key in the process of collaborating with another individual: by focusing on the different skills of our partner we also support and balance our partner, instead of competing at the same tasks. We are different individuals after all. We all have different styles, experiences and backgrounds and this does not mean that one is better than the other. When collaborators are able to acknowledge their inner diversities, there is space for diversity of thinking, perspective, and knowledge. This is a safe space for creative freedom and mutual trust which inevitably take over the fear of competing with one another. Also, merging and separating at different phases of the work has helped me and my collaborators to keep identities and energies intact. The point is that your collaborator is not someone to be threatened by but someone who fosters a creative, receptive, ripe mindset in you and can help you develop it! When collaborators understand and trust one another deeply they can make great things or make great things happen! My latest collaboration with Silvia Salvia Limone has brought to life to a food article supported by a visual story which has been featured on Volume 1 of Table Magazine. We couldn’t be more proud of this project! Silvia and I, in collaboration with our colleague Antonella from Pinterest Clinic, have also developed a Masterclass on Visual Branding and Social Media Strategies, which will take place in London on 27th January 2019. I will write about this masterclass in another post but in the mean time please feel free to click here for more information. Thank you for reading this post. I would love to hear your thoughts on creative collaboration. Drop me a line! Is not secret that one of my favorite things in life is to share food with friends and family. 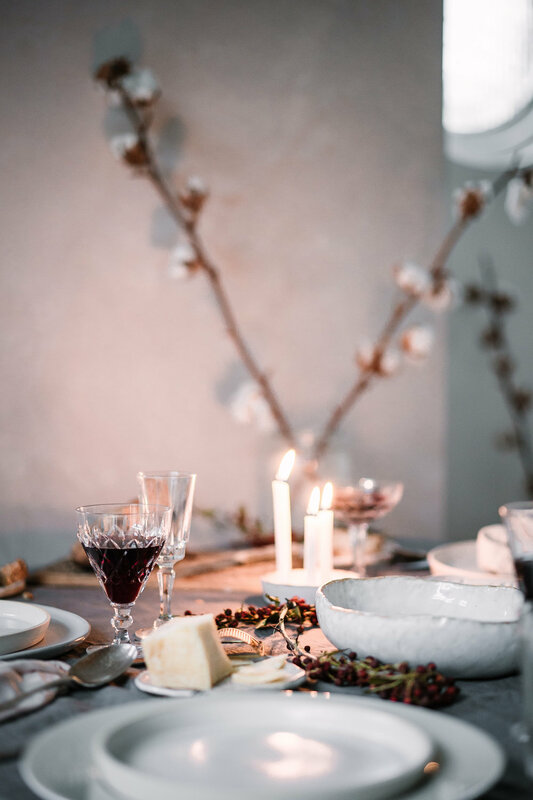 Sitting around a simple and beautiful table graced with honest food and uncomplicated styling is also another favourite thing. I am a firm believer that beautiful things happen when we sit around a table together, listen to each other views and share experiences from a stance of openess and curiosity. When Silvia Salvia Limone called me a couple of weeks ago on a Sunday night and asked me if I would be up for an impromptu cooking with her at her place the following day, I simply could not decline the invitation. I knew that all my favourite things would be parting together. 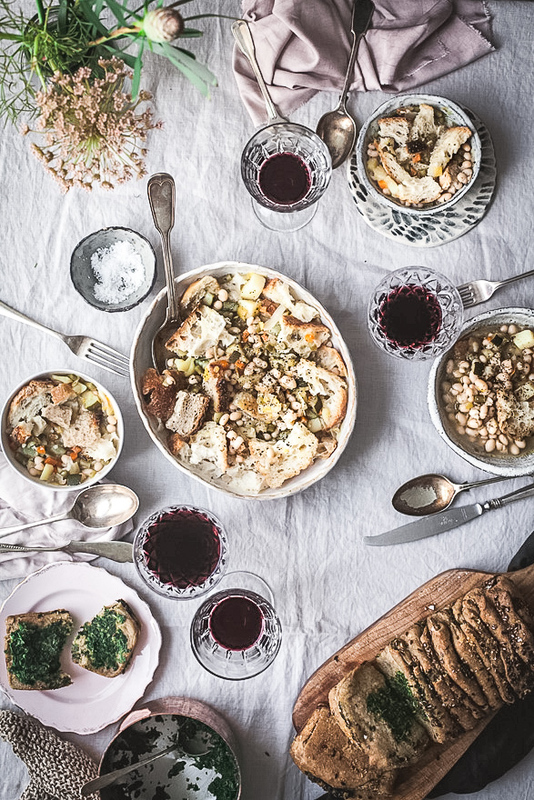 We cooked this hearty vegetarian panzanella, baked a crunchy spinach pull apart bread, styled, photographed the food, enjoyed the meal and worked on deadlines and future projects! I thought to share this humble yet tasty winter tuscan recipe with you and I hope it will inspire! Soak the beans overnight in cold water. Rinse and drain the beans, set them aside. Meanwhile, cook the soffritto in a large saucepan. Heat the olive oil and gently fry the celery, carrot, onion and garlic for about 5 minutes. Add the haricot beans, potatoes, cabbage, leek and zucchini to the soffritto. Season with salt and freshly ground black pepper to taste and cook for a further 5 minutes. Add the stock and bring to the boil, then simmer for 25 minutes or until the beans are tender. Season with more salt and freshly ground black pepper to taste. Serve drizzled with extra virgin olive oil and stale bread. If you ever try this recipe, please feel free to write a line below. I would love to hear from you!